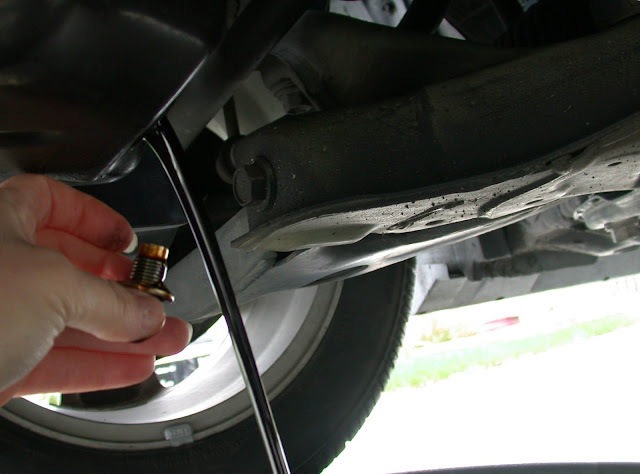 As soon as you remove your oil drain plug, the oil will rush out; be ready to properly catch and dispose of it. Charm city is experiencing yet another sweltering summer. Hot, sticky, humid; makes you want to find A/C or never leave the pool. Guess what? Your car is affected by the heat as well. It’s late evening, the weather is not to bad, and you feel like working on your car. Good for you! Here are some tips to help make your experience with the car as meaningful as possible. If you will be changing your oil and filter, you will need a good set of wrenches, a drain pan with a wide mouth funnel, plenty of rags, and a spray bottle with the cleaning solvent of your choice. Fantastic, 409, or Simple Green will do the trick. Most of the products on the market now are phosphate free and will not harm our precious environment. YouTube has video for just about anything you can think of, and those videos can guide brave new car techs through the proper procedures. If you do attempt a service but get to a point where you need help, you can feel free to ring me up at the shop or send me an e-mail. I can “talk you off the ledge” or at least lend a supporting ear to your situation. I strongly suggest that you do some preplanning such as: What are you going to do with the waste oil and dirty oil filter after you are done your work? You may ask the salesperson where you purchased the supplies if they will accept used oil, most do. If you bought it online, maybe your local auto shop will dispose of it properly for you. Please, please, please be responsible with this and any other waste products you may be creating when you work on your own car. We only have one planet; don’t be selfish and irresponsible by dumping the old oil and filter in a trash can or worse, down a storm drain or rat hole! You may bring it to my shop and I will dispose of it properly. So, what else can you DIY under that “shade tree” that might save you a few bucks? You can drain and fill the coolant or replace the air and cabin air filters. All these services need to be attended to on a regular basis and most are going to be on a YouTube video. If you get in over your head I am sure if you call your shop, dealer, or even me, we would be happy to help you out. Remember, doing simple auto maintenance can be a very rewarding experience as long as you use common sense and—most important—be responsible with any waste products you generate while servicing your car.